Climate change impacts on groundwater: literature review. Water is indeed a medium through which climate change influences the Earth’s ecosystem particularly since any negative impact thereon has ripple effect on almost everything else. The change in frequency, intensity and patterns in rainfall, as well as change in temperature has implication for replenishment of groundwater storage. However, groundwater-residence times can range from days to tens of thousands of years or more, which delays and disperses the effects of climate and challenges efforts to detect responses in the groundwater to climate variability and change. Hence, understanding the potential effects of climate variability and change on groundwater is more complex than it is on surface water. Several studies relating to the effect of climate change on surface water bodies have been undertaken while very little research exists on the potential effects of climate change on groundwater. This literature review aims to collate and depict work done previously on climate change impact on groundwater, with focus on Southern Africa and to serve as a prelude to a research study on what and how appropriate response measures should be taken. A simplistic empirical relationship between mean annual rainfall and recharge was used in research to show that decrease in rainfall over the central parts of Southern Africa could have dire consequences for groundwater dependent communities. Findings were that 20% decrease in mean annual rainfall volumes could translate to an 80% decline in recharge for areas that currently receive 500 mm rainfall per annum or less. Other studies show that the sea-level rise that accompanies climate change will reduce the freshwater supply in many coastal communities, by infiltrating groundwater and rendering it brackish and undrinkable without excessive treatment. This shows that the impact of climate change on groundwater may be in terms of quality such as deterioration of water by saline intrusion or in terms of quantity. In its Fourth Assessment Report, the Intergovernmental Panel for Climate Change (IPCC) projects that Africa will be disproportionately affected by climate change. The projected warming in Africa is 1.5 times the global mean . Such unusual elevated increases in temperature are already being experienced in a number of regions in Africa particularly the Sahel and Southern Africa as exemplified by more frequent El Nino linked droughts and heat waves. Water is a medium through which climate change influences the Earth’s ecosystem. The changing frequency, intensity and patterns in rainfall also have implication for replenishment of groundwater storage, and inform the choice of appropriate technology for sanitation among other. This literature review seeks to identify work that has previously been undertaken nationally, regionally and at global scale in terms of how climate change impacts on groundwater. The impact of climate change on groundwater often manifests itself in terms of changes in recharge, baseflow, sea water intrusion of coastal aquifers or increased evapo-transpiration under dry conditions and high temperatures. Dragoni and Sukhija  define groundwater recharge as the residual flux of water added to the saturated zone resulting from the evaporative, transpirative and runoff losses of the precipitation. It can take place by diffuse infiltration, a preferential pathway, and through surface streams and lakes. Thus groundwater recharge is also a sensitive function of the climatic factors, local geology, topography and land use. In terms of water quality impacts, increased sea surface temperature due to climate change often leads to sea level rise thus, resulting in saline intrusion of coastal aquifers. Establishing or demonstrating the impact of climate change on groundwater “a hidden resource,” is relatively more complicated than it is in the case of impacts on surface water. In a similar vein, the USGS  argued that understanding the potential effects of climate variability and change on groundwater is more complex than with surface water. For instance, groundwater-residence times can range from days to tens of thousands of years or more, which delays and disperses the effects of climate and challenges efforts to detect responses in the groundwater to climate variability and change. However, Renewable groundwater is directly tied to near-surface hydrologic processes; it is thus intricately tied to the overall hydrologic cycle and could be directly affected by climatic change . On the other hand, nonrenewable groundwater supplies are usually derived from deep earth sediments deposited long ago and so have little climatic linkage. Hiscock & Tanaka  reported that in Tokyo a 3°C temperature increase of shallow aquifers to a depth of 20 m, was observed due to warming of ground surfaces and increased urbanization. Several studies relating to the effect of climate change on surface water bodies have been undertaken but very little research exists on the potential effects of climate change on groundwater [6-11] although groundwater is the major source of drinking water across much of the world and plays a vital role in maintaining the ecological value of an area. Analyses of monitoring data often reveals the current relationship between the changing climate and corresponding change in recharge while climate change scenario model projections on the other hand are used to evaluate future impacts. 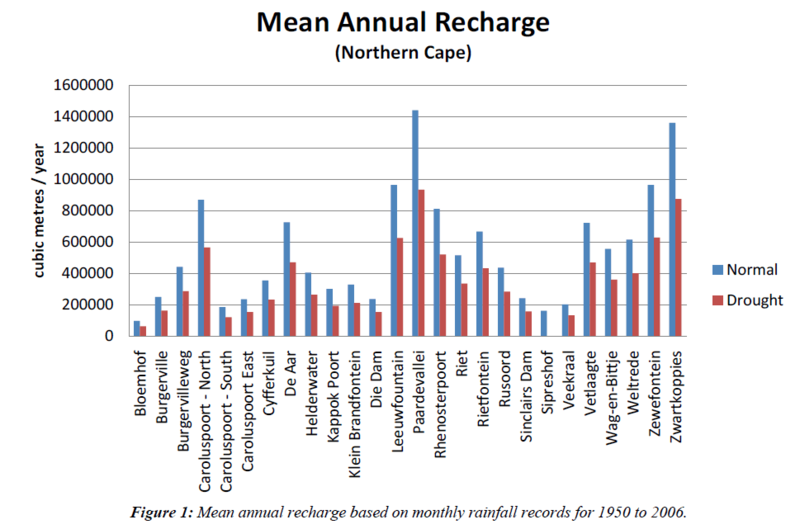 Analysis of the mean annual recharge based on a fifty year plus rainfall record shows changes in recharge in 26 towns of the Northern Cape in South Africa occurs during the wet or dry season (Figure 1). Figure 1: Mean annual recharge based on monthly rainfall records for 1950 to 2006. Clearly recharge consistently reduced during the drought compared to the wet season. Dragoni and Sukhita  observed that dedicated monitoring of various parameters is required for assessment of the effect of climate on a particular groundwater system. There are various approaches for evaluating impacts of climate change on groundwater resources. Some researchers suggest use of large scale global climate models  while lately others recommend downscaled regional climate models  to project climate change scenarios of changes in rainfall and temperature. The typical approach is to then use the downscaled climate values as an input into a hydrological model which is then ran to simulate hydrological responses, or to estimate effects of climate change on groundwater recharge. Studies by Döll  on projected impact of climate change on groundwater recharge by 2050 showed that the spatial pattern and intensities of changes vary with the emissions scenario and the climate model used to translate emissions into changes of climatic variables. However, all scenarios agree broadly in that groundwater recharge will increase in northern latitudes, but will decrease strongly, by 30-70% or even more than 70%, in some currently semi-arid zones, including the Mediterranean, northeastern Brazil and southwestern Africa (Figure 2). Figure 2: Impact of climate change on long-term average groundwater recharge in the 2050s. Long-term average 1961–1990 groundwater recharge, in mm yr−1, and per cent changes between 1961–1990 and 2041–2070, as computed by WGHM applying four different climate change scenarios (climate scenarios computed by the climate models ECHAM4 and HadCM3, each interpreting the IPCC greenhouse gas emission scenarios A2 and B2) after Döll (2009). According to the results of a global hydrological model, groundwater recharge, when averaged globally, increases less than total runoff (by 2% as compared with 9%) until the 2050s for the ECHAM4 climate change response to the SRES A2 scenario. Demand for water use often increases under climate change. However, the increased use is driven by various stress factors including both climatic and non-climatic stress factors. Cave et al. contends that interest in determining impacts of climate change on groundwater resources is growing rapidly, particularly in Southern Africa, due to the increasing scarcity of water resources, as a result of increasing water demand for industrial, agricultural and drinking water use. However, groundwater responses to rainfall events have a longer lag time than the corresponding hydrological response in surface water systems. The impacts of changes in rainfall on groundwater are generally smoothed over a short term. As a result, groundwater supplies are reasonably well buffered against the impacts of climate variability and provide a valuable resource to cope with short-term drought conditions, particularly in a conjunctive use situation. The presence of palaeo-groundwater (i.e. very old or fossil water) in several arid zone aquifers, however, illustrates that groundwater systems are not resilient to long-term climate change. Cave et al. used a simplistic empirical relationship between mean annual rainfall and recharge, to show that a decrease in rainfall over the central parts of Southern Africa could have dire consequences for groundwater dependent communities. Their findings are that 20% decrease in mean annual rainfall volumes could translate to an 80% decline in recharge for areas that currently receive 500 mm rainfall per annum or less. The hydrological model was used to quantify the impact of climate change on state of groundwater resources in terms of changing levels and recharge. The observed rainfall-recharge relationship in Figure 3 is used to examine possible trends in groundwater impacts that might be expected if projected changes in mean annual precipitation occur in response to human-induced climate change. 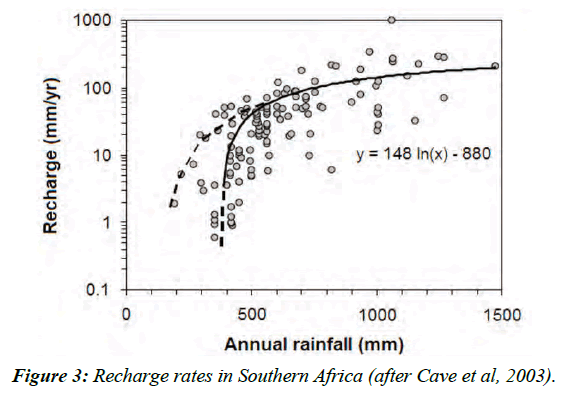 Figure 3: Recharge rates in Southern Africa (after Cave et al, 2003). (3) changes in rainfall intensity can have a greater impact on recharge fluxes than rising atmospheric CO2 concentrations. It is also commonly known that carbon dioxide is a greenhouse gas that is a major driver of climate change. One of the key questions could be: “what then does this relationship between recharge and climate change as evidenced by studies alluded to, mean for water resource management?” A 15% reduction in rainfall, with no change in temperature, results in a 40-50% reduction in recharge, inferring that small changes in rainfall can lead to large changes in recharge and, hence, in groundwater resources . It is also worth noting that unlike other factors of climate change such as temperature which show evidence of change by either decreasing or increasing trends, rainfall particularly in South Africa is highly variable and indicates change in climate by shifts in aerial distribution as well as changes in intensity particularly when the change is sustained for decades or over a long time. Climate change exacerbates increase in water use and groundwater is often the ideal solution to this challenge. Due to increased temporal variability of surface water flows, climate change is likely to lead to higher demands for groundwater . Carter and Parker  estimated that about 50% of Africa’s nearly one billion people rely on shallow or deep groundwater. Their study showed that the combined effects of urban population growth, rising food demands and energy costs, and consequent demand for fresh water represent real cause for alarm, and these dwarf the likely impacts of climate change on groundwater resources, at least over the first half of the 21st century. However, Calow and MacDonald  contend that of Africa’s population of 900 million, roughly 60% live in rural areas and probably 80% rely on groundwater for domestic and other water needs. In South Africa as surface water became oversubscribed and competition for use escalated gradual increase in users’ reliance on groundwater for supply became a norm. The situation is exacerbated by rising temperatures, increasing heatwaves and high evaporation rates. Increased temperature under a changing climate causes increase in evaporation rate which in turn leads to reduction in runoff and recharge (i.e. reduced surface flow and less water available for aquifer replenishment). Some studies undertaken in South Africa  show that climate change does affect groundwater level, recharge and contribution of groundwater to baseflow. Climate change is not expected to only affect input (recharge) or output (discharge), but also to influence the quality of groundwater as stated by Dragoni and Sukhija . Their investigations indicated that water recharged during an arid period has a higher concentration of salts and hence higher Total Dissolved Solids, while during a wet period the converse may occur. Salt water intrusion of coastal aquifers by rising sea water levels, due to increased sea surface temperatures driven by climate change is another example of how climate change impacts on water quality of the resource. The intrusion can also be triggered by over pumping in coastal areas perhaps due to either poor management of water use or increased demands resulting from stress factors that are related to climate change or non-climatic stressors. In fact this may also be driven by drought. Increasing frequency and intensity of droughts in the catchment area would lead to more serious and frequent saltwater intrusion in the estuary  and thus deteriorate surface water and groundwater quality. The sea-level rise is projected to extend areas of salinisation of groundwater and estuaries, resulting in a decrease of freshwater availability for humans and ecosystems in coastal areas . Dyer  warns that the sea-level rise that accompanies climate change will reduce the freshwater supply in many coastal communities, by infiltrating groundwater and rendering it brackish and undrinkable without excessive treatment. Additionally, any decrease in groundwater recharge will exacerbate the effect of sea-level rise. In inland aquifers, a decrease in groundwater recharge can lead to saltwater intrusion from neighbouring saline aquifers . In conclusion it is important to conserve sinks such as vegetation, particularly forests as these reduce greenhouse gas emissions. Otherwise, the unintended consequences may make matters worse. Deforestation in Sri Lanka  caused rapid surface water runoff, thus reducing recharge, hence also decreasing baseflow (i.e. groundwater contribution) to streams during dry seasons. These studies demonstrate that a notion that climate change does not impact on groundwater is not entirely correct but rather that although groundwater is buffered from direct impact, the climate may indirectly influence the resource by reducing recharge, discharge or even impacting on the water quality. Taylor RG, Koussis AD, Tindimugaya C. Groundwater and climate in Africa- a review. Hydrological Sciences Journal. 2009;54(4):655-64. Dragoni W, Sukhija BS (editors). Climate Change and Groundwater: A short Review. Geological Society, London, Special Publications. 2008;288:1-12. US Geological Survey. Effects of Climate Variability and Change on Groundwater Resources of the United States; USGS Global Change Program Office, Fact Sheet. 2009;3074,4p. Braune E, Moseki C, Duah, A. Issue Paper: Groundwater and Society in Africa – learning to cope with the effects of climate variability and change. 2009. Hiscock K, Tanaka Y. Potential Impacts of climate Change on Groundwater resources: From the High Plains of the U.S. to the flat lands of the U.K. National Hydrology Seminar. 2006. Green TR, Bates BC, Fleming PM, et al. Simulated impacts of climate change on groundwater recharge in the subtropics of Queensland, Australia. Taniguchi M (editor). Subsurface Hydrological Responses to Land Cover and Land Use Changes, Kluwer Academy Publ 1997;187-204. Holman IP. Climate change impacts on groundwater recharge- uncertainty, shortcomings and the way forward? Institute of Water and Environment, Cranfield University, Silsoe, Bedford MK45 4DT, United Kingdom; Hydrogeology Journal. 2006;14(5):637-47. Woldeamlak, ST, Batelaan O, Smedt F. Effects of climate change on the groundwater system in the Grote-Nete catchment, Belgium. Hydrogeology Journal. 2007;15:891-901. Bates BC, Kundzewicz ZW, Wu S, et al. (Eds.) Climate Change and Water Technical Paper of the Intergovernmental Panel on Climate Change, IPCC Secretariat, Geneva. 2008:210 pp. Carter R, Parker A. Climate change, population trends and groundwater in Africa. Special issue: Groundwater and Climate in Africa; Hydrological Sciences–Journal–des Sciences Hydrologiques. 2009;54(4). Nyenje PM, Batelaan O. Estimating the effects of climate change on groundwater recharge and baseflow in the upper Ssezibwa catchment, Uganda, Special issue: Groundwater and Climate in Africa. Hydrological Sciences–Journal–des Sciences Hydrologiques. 2009;54(4):713-26. Bouraoui F, Vachaud G, Li LZX, et al. Evaluation of the impact of climate changes on water storage and groundwater recharge at the watershed scale, Climate Dynamics. 1999;15:153-161. Pitz C. Predicted Impacts of Climate Change on Groundwater Resources of Washington State Environmental Assessment Program; Washington State Department of Ecology; Department of Ecology, State of Washington. Publication No. 16-03-006. 2016:107p. Cave L, Beekman HE, Weaver J. Impact of Climate change on Groundwater recharge Estimation. In: Xu Y, Beekman HE (editors) Groundwater recharge estimation in Southern Africa, UNESCO IHP Series No. 64, UNESCO Paris ISBN 92-9220-000-3. 2003. Taylor RG, Scanlon B, Döll P, et al. Ground water and climate change. Nature Climate Change. 2013;3:322-29. Portmann FT, Döll PD, Eisner S et al. Impact of climate change on renewable groundwater resources: assessing the benefits of avoided greenhouse gas emissions using selected CMIP5 climate projections. Environ Res Lett. 8. 2013. Calow R, MacDonald A. What will climate change mean for groundwater supply in Africa? Overseas Development Institute, BGS; Background Note. 2009;8 p.
Dennis I, Dennis R. Potential Climate Change Impacts on Karoo Aquifers. WRC Project No KV 308/12; Water Research Commission of South Africa, Pretoria. 2013. Dyer WL. Relationship of Climate Change to Seawater Intrusion in Coastal Aquifers, Unpublished thesis for a Master of Science degree, Graduate College of the Oklahoma State University, USA. 2014. Chen Z, Grasby SE, Osadetz KG. Relation between climate variability and groundwater levels in the upper carbonate aquifer, southern Manitoba, Canada. Journal of Hydrology. 2004;290:42-62.